Whether you love or hate the phrase “personal brand” (and it seems some of us do hate it 👇), having one is necessary for success as an entrepreneur — and inevitable in the age of social media. So we asked Branding Consultant (and Qchat regular! ), Gabriela Cardoza, to co-host our Twitter chat on ‘Personal branding as an entrepreneur’. Q1 How would you define the term “personal brand”? Q2 Why is having a personal brand important as an entrepreneur? Branding has always been an important part of business for all sorts of companies, both large and small. However, the concept of personal branding has become much more prevalent with the arrival of the Internet and social media. Why is this something entrepreneurs should put time, effort, and maybe even money, into? Q3 What are the best channels for personal branding? OK, so now we know the ‘why’, how do we go about building up a name for ourselves? Our Qchatters recommended thinking carefully about which social channels your audience hangs out on, but also to include offline channels in your strategy, like networking events. Q4 How do you keep your personal brand consistent across different platforms? Q5 How ‘personal’ should a personal brand be? How much of your personality can you show in a professional context? Social media has broken down barriers in the working world, making our professional relationships much less formal. So where do you draw the line between your private and public lives? Q6 Do you have any tips for developing your elevator pitch? 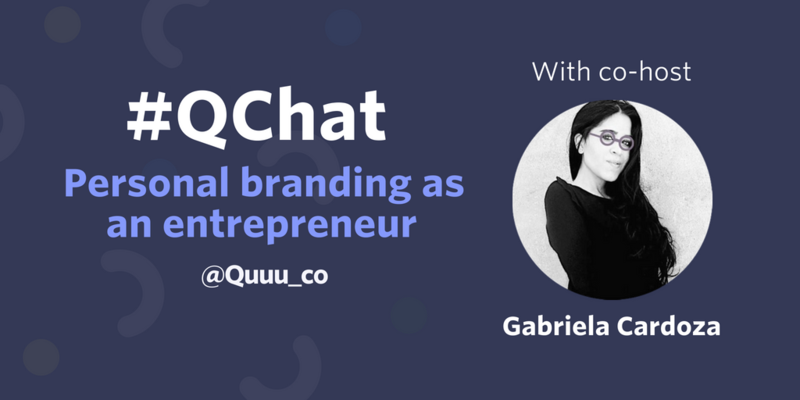 At the beginning of the Qchat, Gabriela mentioned how crucial it is to work out your USP as an entrepreneur. In our penultimate question, we explored some formulas and strategies for laying down the foundations of your personal brand. Q7 Whose personal brand do you really admire? Your personal brand is how you package your identity, personality and skills to influence how your target audience perceives you. Especially as the market becomes more crowded, having a strong personal brand will help your customers differentiate you from the competition; people connect with other people. The best channels for personal branding depend on your audience, industry and individual preferences. Don’t forget about offline opportunities, like events, either! Stay true to your personal brand across different platforms. Using the same colours, visuals and handles can help you achieve consistency. Don’t be afraid to show some personality, but don’t overshare — when in doubt, err on the side of professional. When developing your elevator pitch, address your audience’s pain points and explain how you can solve them. Keep it short and practice, practice, practice! Think outside the box when looking for inspiration for personal branding. Look to people whose brands are memorable and consistent, from the Queen of England to Queen Bey. A big ThanQuuu to Gabriela for co-hosting, as well as Saltmarsh Marketing, Tawanna Smith, MPP, Andrew Vorster, LJ Sedgwick, Muthoni Wambugu, Janette Speyer, Ruben Richardson, Brandi Rand, Liezel Van Der Westhuizen, Wade Stewart, JMatt, Jose Watson, 4Track, Sabrina Cadini, Martin Lieberman, Amy Murnan, Phumeza Langa, RocketBrand, Asia Matos, Portia Mogale, Daniel Kempe, Marisa Cali and Veronika Baranovska for joining the Qchat!